Ronaldo scored twice in the first 18 minutes to put his side 2-0 ahead against a rival struggling in the relegation zone. Real Madrid opened up a seven-point lead over La Liga title holders FC Barcelona while remaining six clear of second-placed Sevilla as it rode its luck to defeat Sporting Gijon 2-1. 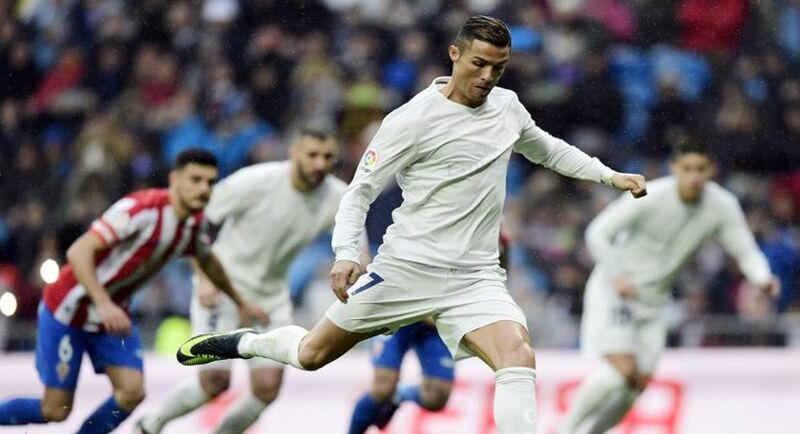 Although superstar striker Cristiano Ronaldo scored twice in the first 18 minutes to put his side 2-0 ahead against a rival struggling in the relegation zone, Madrid allowed Sporting to claw back into the game at the Santiago Bernabeu Stadium on Saturday. Carlos Carmona pulled the visitors back before halftime and Duje Cop wasted a magnificent chance to take an unlikely point when he skied a penalty high and wide after a foul on Victor Rodriguez with just 15 minutes remaining. Despite that miss, Sporting kept on pressing. It was Real Madrid, on a rainy afternoon, who was waiting for the final whistle to end the match. Sevilla recovered from their midweek defeat in the Champions League with a 2-1 home win over Valencia thanks to an own goal from Ezequiel Garay and a shot from Nico Pareja following a corner 15 minutes from time. Munir had scored for Valencia 10 minutes earlier to give them hopes of a draw but it remained only a fleeting glimmer of to their aspirations. Malaga claimed its fifth successive home win as it won 4-3 at home to Deportivo La Coruna. Deportivo look an early lead thanks to a Celso Borges penalty, but Michael Santos equalised from the penalty spot before Sandro Ramirez made it 2-1 with an excellent free kick. Santos scored Malaga’s third goal, 10 minutes after the break to extend the lead to 3-1. But Florin Andone scored a header to give Deportivo hope and an error from Carlos Kameni saw Borges equalise in the closing minutes. The game looked destined for a draw, but youngster Ontiveros gave Malaga the win in injury time with an unstoppable 25-yard shot. Pablo Piatti scored twice as Espanyol upped the pace to claim its first home with of the season with a 3-0 victory over Leganes. A dull game sprang to life with Gerard Moreno’s goal in the 46th minute. Piatti assured the points with his first goal six minutes later and his second with two minutes left on the clock.